What a lot of legal professionals might not yet understand is that tertiary industries like ours rely heavily on the primary and secondary sectors of the economy to survive. The primary sector is on life support and every day more likely to collapse. The secondary sector of the economy relies upon the primary sector of the economy to survive. The tertiary sector relies on both. Over the last few years, running a law firm has become more expensive, and, as an industry, our services have often become more of a grudge purchase for clients, a necessary luxury fewer can afford. Many lawyers don't increase their fees with inflation anymore, knowing their clients just can't afford to pay more. But the collapse of each sector becomes more likely as each month fades into the next. Eskom is keeping the lights on the same way many of you do when the lights go off, with diesel. A lot of us rely on government, whether deeds or masters' offices or courts for much of our livelihood. These rely on some degree of regular power supply. Then there is the Legal Practice Act which might be regulating industry to death. The plan has also been announced by the powers that be to change the mandate of the Reserve Bank so it can print more money, affecting supply of cash in an economy without enough demand, thus causing further inflation, what Ayn Rand called theft (of citizens' income and savings) by remote control. The state, also, has plans to introduce prescribed assets, forcing pension funds to effectively make loans to it and SOEs which no one else will make. South Africa's government is three trillion in debt and is borrowing two billion rand a day to keep the cogs of state machinery turning. The sands of the hour glass are running ever faster out. Whether our electricity prices which are at twice international norms, breaking infrastructure, taxation well beyond the Laffer curve, on the verge of collapse water treatment, industry, or the economy itself, something is likely to give. South Africa has the worst in-out investment ratio of any non-tax-haven. South Africans, per the statistics, are moving everything they can offshore, while foreigners just aren't investing in the economy. Surveys and statistics, as well as anecdotal evidence all find our professional class is leaving our shores. Doctors say they will not stay if NHI passes, but the state continues on with it, and so many are leaving anyway, taking their essential skills with them. A lot of the attorneys I know are leaving, they just haven't announced it officially yet. Many top law firm partners and directors, and advocates are getting jobs as legal secretaries and paralegals overseas. Engineers, per media reports, are leaving the country, due to threats at gunpoint by RET forums at construction sites. Both Price's Law and the Pareto Principle teach us, from economics, that a tiny proportion of people produce most of what is created in an economy. The ratio is incredibly skewed, with so few hyper-productive individuals creating most of a nation's wealth. This is reflected especially starkly in South Africa where just a few hundred thousand taxpayers pay the vast majority of the tax revenue of the country. When an economy hits an iceberg, those who have means are the first to put on their life jackets and jump to somewhere safer. A disproportionate percentage of South Africans are employed by the state, and so many survive off of social grants. Yet more survive due to doing business with the state, its employees, and with recipients of social grants. As the private sector loses its most productive citizens, its revenue shrinks, and so does collectable tax. South Africa is so far beyond the Laffer curve, that any further taxation will just shrink tax revenue. As the state's debt and responsibilities continue to increase, the bedrock of private industry it sustains itself upon is heaving under a weight which could soon collapse it. South Africans as a people have always been robust, and its attorneys have been as well. Those of us still in the industry are still making enough to make our careers worthwhile. However, we are sitting on a national timebomb, or rather are within a grid of dozens of bombs. Which will go off first is uncertain, but any one could set off the rest. Your three to five year plan should probably be open to the possibility of getting your affairs in order, saving up, updating your CV, and considering closing up shop and emigrating to more certain climes, if need be. A client has appeared before you, a notary public. You drafted an ante nuptial contract, which they and their spouse-to-be, and two witnesses signed in front of you; they, you, and the witnesses, initialling the bottom right of each page in black ink, and all signing in the right spot on the last page. You signed, your signature appearing in a spot: below Quod Attestor and above Before me Notary Public, and placed your stamp by it, as well. As you already have an account with the Deeds Office, having climbed up to the 26th floor of Marble Towers, and given in the requisite documents and forms to finance, and having gone through to data collection for them to record your signature and details as a notary, I will not note that process in this piece. You opened your protocol register (a rather expensive book which can be bought at some Waltons stores, and other stores online or elsewhere) and filled out the number of the deed, the date of your clients signing it before you, that it was an ANC, the names of the parties, and then other details you deem pertinent, under comments, and then you stored all important documents in your protocol (likely a lever arch file with non-leaching plastic flip folder style pre-punched paper sheaths in it, so no important document gets punched), which is locked away safely, along with your protocol register. The deed number in your protocol register, either starting from 1 each year or from 1 in total, corresponds to the protocol number you then enter on the ANC itself. When the registered ANC is back from the deeds office, the first signed original is what you still keep in the protocol register, this and not the registered ANC is deemed the original. In fact, it is a signed copy of the original and not the original itself which is to be lodged at the deeds office. It is time to lodge and register your client's ANC with the Deeds Office, on the 26th floor of Marble Towers. Before you jump in your car, and drive to the centre of town, you need to do a few other things first. You need to get a green cover for your ANC to be placed in. On the top left corner you should have your firm name and number, and a telephone number, or your firm stamp. The rest of the front and back sides of the cover should have standard required fields and typing on them, at the right places. You should be able to buy a hundred customized green covers from specialist stationers for about five hundred rand, including delivery. Fill out your reference number, so they know what to put in any communications to you for that ANC. By code, next to 1, say H, and put the name of the first party, a forward slash, and the name of the second party, under name of parties, under firm number, put your firm number as assigned by the Deeds Office (and emailed to you by them) when you set up your account, and under batch, say 1. Under linking, in both boxes say 1. ANCs never tend to need linking. On the front of your ANC itself, staple on a blank sheet of A4 paper, and put your firm number on the top left of this. You will then need to put your ANC into its own green cover. Your cover still needs a barcode, so the deeds office can charge you for the whole thing. You need to bring with a signed letter on your firm's letterhead, signed by a director, partner, or sole proprietor of your firm. Its heading should be along the lines of 'Representatives to apply for and collect barcodes at deeds office'. The signatory should set out who they are, and their position in the firm, and state that they authorise a specific person, stating that person's full names per their government issued Identity Document and Identity Number and that they specifically authorise them to apply for and collect barcodes from the deeds office. This should be handed in at the office where barcodes are allocated, and the representative doing so must present their government issued Identity Document when collecting such. You will probably get at least a sheet with a few dozen barcodes on it. You will need to sign, and they will record which barcodes have been given to you. You don't pay anything for barcodes until they have been used for registering a document. You place the first barcode in the set on the bottom right of the front end of your filled out green cover. For notarial work you are unlikely to need to write anything on the back cover, which should merely have the standard writing etc on it. Nothing is written on the cover on its inside, where the ANC will be placed. Take the cover, ANC within, to the lodgement counter. They will take the cover, ANC inside, and stamp it, enter it in their system, and take it from you. Within about 5 business days from then, if all goes well, the deed will have gone through two examiners, and be placed in your pigeon hole, having been placed into prep. You can do a deeds office tracking at the same place you got the barcodes for about R 13.00, to see where your ANC is in the process. You will need to know what the barcode number is. Once your ANC has entered prep, it is vital you execute it within 5 days of it entering prep. So, take it to the preparation desk, and ask for permission to execute the deed there, handing it over. Otherwise, the deed will lapse and won't be registered. They will not allow you to execute on the same day as asking to execute, unless there are some special circumstances and permission granted to you. It can be a good idea to set it down for execution for the next working day. On the execution day, sometime before 10h30, you go in, go up to floor 26 in Marble Towers, as always, and go through to preparation to get your ANC, they having authorised your execution for that day. You then go through to a small computer, where you take out your pen and fill in the date next to date on the green cover, and sign to the right of that. They scan the barcode on the ANC, and take it from you. Within about 2 days, it may be scanned in. Within 5 working days of your executing it, if you go in, and go to the distribution desk and ask if there is anything for firm (your firm number), they should be able to give you your ANC, which they will have stapled into its cover. Take the ANC, bring it back to your office. Scan it in for your client after you undo the staple that holds it in its cover. A notary must keep an original of every deed executed before him, in his protocol. However, practice here seems to differ at times. It is the signed original which the notary is to keep in his protocol, the registered copy from the deeds office can be given to the client. The cover will have stamps for lodgement, execution, for each of the two examiners and their groups, its scan, and a dated stamp from the registrar of deeds on the front. On the back there may be a stamp saying 'Final Black Book' and a date. Inside, the ANC will have a stamp stating the fee the deeds office charged you (likely R319.00), a stamp saying 'registered' with a signature and a date, and a stamp with an H and Johannesburg on it, and the H number of the year (e.g. 111111/2018) on it. Your A4 sheet should also be in the cover, likely at the back. You will later need to pay the deeds office for each ANC you register there with them. For the clients, a letter to be handed to their marriage officer will need to be drafted before they wed, which can be any time after they sign the ANC before you as notary. If something is wrong or right, the best way to find out is by going into the deeds office, and checking your pigeon hole and doing deeds office tracking. You don't tend to find out how things are going with your matter otherwise. Nothing in this piece should be relied upon as legal advice. For that, make an appointment with your attorney. Tick Tock. The clock did stop. Cause. Effect. Until the start. A big bang, or a tiny grain of sand. Go far enough back, there must always be a cause. Something, a start, to continue to, dominoes, cause and effect. But take infinity, call it X. What was the first cause of effect. What is logic? Cause and effect. And that foundation must cause an effect, the specific effect, it must follow. And yet, the entire universe is a non sequitur. It does not follow. And nor can magic: for magic is mechanical in its thinking, the precursor to science, it believed that one act, whether ritual or effective, certainly would cause another. And whether a big bang, steady state, multiverse, or ever repeating loop, something must have brought it into being. A first knock upon the movement, the cause and effect we call time, for without energy, entropy would break the clock, even one in a circular loop. Without some outside cause for its effect, some source, all movement would stop. What else is left? For time is cause and effect? But then something not bound by time, must have had an effect. For, what caused X, what caused the first slight or great movement of time? The clock stops, for by its logic we know not its cause, the cause of logic, or time, of before and after, of cause and effect. Either that, or logic, the patterns we observe as absolute, is neither universal, nor much but a precursor, like magic. For the very first cause, logically, could not be an effect. 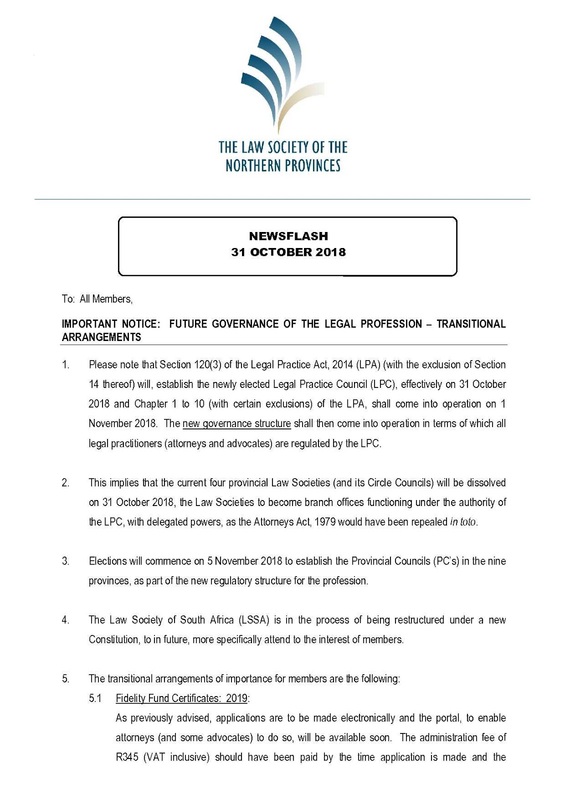 The Law Society of South Africa and Law Society of the Northern Provinces have both sent out final messages before they dissolve. The Legal Practice Act is upon us. Below, images of the LSNP message, followed by a quote of the message the LSSA sent out today. Tomorrow, 1 November 2018, will see the implementation of the Legal Practice Act 28 of 2014 (with some exclusions). Proclamation R 31 of 2018 was gazetted on 29 October 2018 proclaiming the commencement of certain sections of the Legal Practice Act 28 of 2014 (LPA). 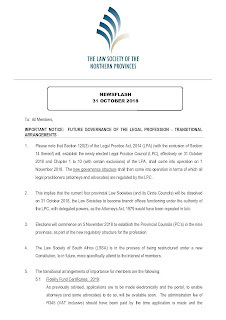 It fixes Wednesday, 31 October 2018 as the date on which Chapter 2 of the LPA, with the exclusion of s 14, comes into operation and Thursday, 1 November 2018 as the date on which the rest of the LPA (with some exclusions) comes into operation (see below) and the provincial law societies are abolished. The Legal Practice Council (LPC) will begin to regulate the profession. We, as the Law Society of South Africa (LSSA), will continue to be there for you as a voluntary body to represent, support and assist attorneys. An amendment to our constitution was signed on 29 October 2018. The Black Lawyers Association and National Association of Democratic Lawyers remain our constituent members together with provincial attorneys' associations (which replace the four provincial law societies). Please e-mail us on LSSA@LSSA.org.za or call us on (012) 366 8800. We urge you to ensure that your details are kept updated on our database so that you can continue to receive newsletters and advisories from us, as well as the Legalbrief LSSA Weekly on Friday mornings and De Rebus on a monthly basis, if you are a practising attorney or candidate attorney. 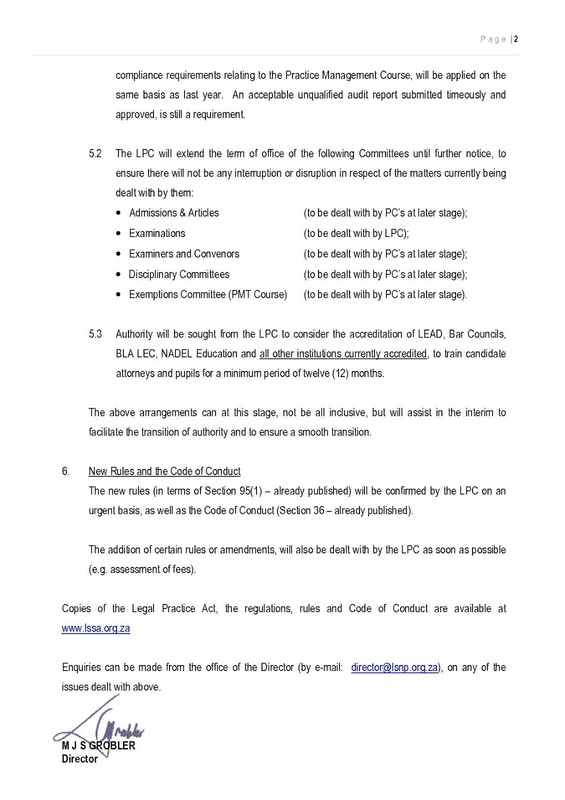 Chapter 2 of the LPA has been implemented and the Legal Practice Council (LPC) has been constituted. It elected its office bearers as follows: Johannesburg attorney Kathleen Matolo-Dlepu and Johannesburg advocate Anthea Platt SC as Chairperson and Deputy-Chairperson respectively. The members of the Executive Committee are Greg Harpur SC (advocate), Trudie Nichols (attorney), Lutendo Sigogo (attorney), Jan Stemmett (attorney) and Phillip Zilwa SC (advocate). The National Forum on the Legal Profession has been wound up. The rest of the LPA will be implemented (with exclusions as listed below, including most of s 35 which relates to fees). The Attorneys Act, 1979 will be repealed and the statutory provincial law societies abolished. The LPC will take over the provincial law societies' staff and assets and commence to regulate the legal profession (attorneys and advocates). Chapter 1 - Definitions, application and purpose. Chapter 3 - Regulation of legal practitioners: This includes s 35 with the exclusion of subss 35(1), (2), (3) and (7) up to and including (12) which deal with fees for legal services. The LSSA wrote to the Justice Minister some time ago requesting the suspension of these subsections until the investigation by the SA Law Reform Commission has been completed and there has been proper consultation. 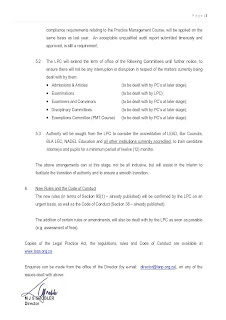 This means that only subss (4) and (5) of s 35 relating to the SA Law Reform Commission investigation on fees for legal services and (6) legal fees payable by Government, will come into operation. s 42 - monitoring of disciplinary functions by the Ombud. Chapter 10 - Part 3 - Transitional provisions; and Part 4 - Repeal of laws. 2019 Fidelity Fund Certificates are to be dealt with in terms of the requirements of the LPA and its Rules (gazetted in GG 41781 dated 20 July 2018). The application process will commence on 1 November 2018, although the new Fidelity Fund certificate online portal will be available only from 12 November 2018 on the Legal Practitioners' Fidelity Fund website at www.fidfund.co.za. the completed application is to be dealt with electronically on www.fidfund.co.za. Dedicated staff members at the regional offices of the LPC (as above) have been made available to deal with enquiries relating to Fidelity Fund certificates. Please consult the Memorandum on Candidate Attorneys currently serving under Articles of Clerkship. Read / download here. Don't kill your message, messenger! Don't kill your message, as a messenger. He stood at the pulpit, above the altar, bright light reflecting off his head. His hands moved in an ornate dance as he spoke, like a cricketer practising bowling, or a rather camp drag queen in a pantomime. His voice relayed a great exaggerated excitement, as he shouted into a dead-still microphone, which somehow withstood the figurative spell of his hands and shouty tone. The priest speaking to the thousand parishioner captive audience at tonight's Roman Catholic mass, at the church I attend, for me, displayed everything I avoid doing when public speaking. Shouting alienates your audience, and causes a fight and flight response in them - they are unlikely to remember what you said, and high frequency changes in tone and passionate hand movements distract from your message and pretty soon begin to annoy an audience when you have to present to them for any real length of time: just ask parents forced to watch children's shows. When I was still a teenager, I remember reading a book where an aircraft was in quite a bit of trouble. The air traffic controller communicating with the person flying the plane was portrayed as having an unnaturally calm and steady voice. Emergency line operators often adopt something similar. So do attorneys and advocates who regularly frequent the courts: they have a clear, crisp voice, nearing as close to non-accented speech as they can achieve, with a mouth achieving sounds in a firm but relaxed manner. When I was doing Practical Legal Training after university, I remember sitting through the speech of a similarly passionate, or perhaps faux passionate speaker, who shouted her way through her presentation to the class, gradually turning off almost every member of her audience, with an aggression that was not assertive. The lecturer praised her boldness and passion, while the audience was captive, but not captured or captivated. Something you learn when often speaking before people is to throw your voice, and amplify its sound without engaging in the growling tone of voice that is the essence of shouting. A good speaker gains volume, without aggression, and passion, without force. They allow their voice and message to resonate in hearts and minds, and calmly draw their audience in, as though they were speaking to each in attendance, person to person. The large parish I attend on Sundays rotates different priests relatively often, and I often enjoy ruthlessly judging them. A similar advantageous game is to observe politicians before parliament, such as Prime Minister's Questions in the British House of Commons. A lot can also be gained from watching the process and proceedings before court. You can often guess the seniority of advocates by how they present. The longer they have been at the game, the softer spoken, and yet firmer in what they say, they become. A lawyer in their element will present with good volume, a magical calm, and a crisp and clear voice which is easy on the ears, even when speaking for hours at a time. The power of their words is in their argument, and they tend to feel no need to growl along with it. Many a public speaker could learn much from court attorneys and advocates in this regard. I often see questions about legal drafting. What is good legal drafting? In the modern era, good legal drafting, is just good English drafting. Yes, you check legislation and case law, but then you set out the positions of the parties in as close to ordinary everyday speech as you can, and in as accurate and specific manner as you can. Legal drafting is just writing, and writing is just communicating with letters and grammar instead of vibrations in the air. Obviously, there are some rules, such as keeping as close to one point in a clause as possible, and numbering your pleadings and paragraphs in affidavits, but those are simply an outside form to help you, your opponent and the court out a little. So, get over this idea that good legal drafting is some sort of 'witchcraft' ritual where you always must use the perfect words, and where 'spells' that have already succeeded are much sought after. Rather look at the substance and argument which succeeded for others. Look to the case law, legislation, regulations, and to the logical parts of your inner mind and soul. Make a case with your words, one which would convince an average person, and even convince someone who often has words thrown their way. The basics of logical argument are essential here: make sound, cogent points. Use logic as a weapon. Draft from your mind. Write out a case for what you want and then pray to the court for it, or demand it of your opponent, or place a spot for parties to sign it. It isn't nearly as difficult, and pleadings, affidavits, and legal documents (besides the sort of stuff that goes to the deeds office) are not nearly as fragile as you might have been brought up via university to believe. Law is practical, and while process and form are important, far more of it is substance than anything else. The rule of law is severely damaged when the state does not hold itself to its contract with its citizens. Over recent decades, law has slipped to the extent that South Africa now has several violent riots daily, most of which never make the media. The lawlessness across the country has been accelerated since the new presidency took over, with government announcing plans to change the covenant it has with the people to get rid of one of the three key stone human rights, the right to property. Firefighters now need to wear protective gear, and fire stations, like libraries and schools, risk being burnt down. With crime rates similar to war zones, and widespread unrest, South Africa, unlike upmarket areas, has many of the characteristics of a failed state, this can be traced back to a lack of respect by the government for the rule of law, tracing back to the end of the presidency of Thabo Mbeki. So, why are there areas of the country which are not so deeply hurt by the gradual collapse of the state? A good portion of arrests in for instance Northcliff, are not effected by police but by private security. In true anarchocapitalist nature, private security companies have effectively replaced the police in areas that can afford them, providing patrols, armed response, and arresting suspects. Likewise, private investigators and lawyers often get involved in the investigation and reporting of crimes, to counter a lack of capacity in the police, and community policing forums also play a massive role in keeping calm on the surface of the upmarket parts of the country. The further the state has collapsed, the more the private sector has in some areas picked up the slack, for now. Our moral compass defines our identity (to others) - science. Justin Bieber supports KKK in video obtained by The Sun. Ukrainian protesters armed with Molotov cocktails gunned down by soldiers in Ukraine's South East. Oscar Pistorius will not be acquitted, that isn't his team's strategy anyway. Holster that pen... you scoundrel. Calm your horses, before they trample you! Have our articles delivered to your inbox. 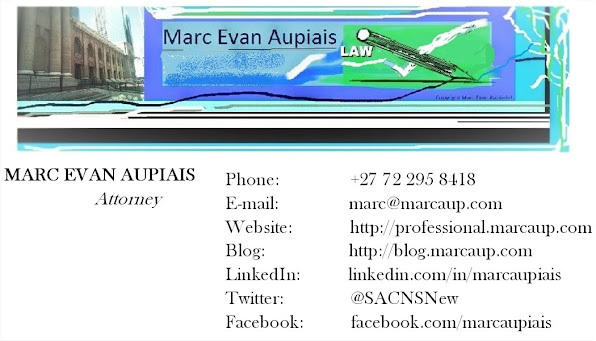 Picture of Marc Evan Aupiais. 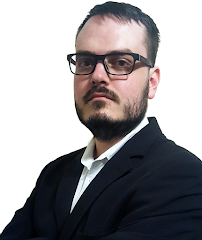 Attorney; Writer; Enthusiast of Germanic, Celtic, & Romance languages, with a love of exploring law, speech, legal systems, linguistics, sociology, & int. news. Copyright Marc Evan Aupiais. Simple theme. Powered by Blogger.